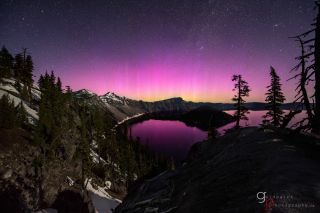 Brad Goldpaint took this image of the aurora borealis over Crater Lake National Park, Oregon on June 1, 2013. The purple glow of the aurora borealis dances over Crater Lake in this beautiful night sky photo. Hoping for a long-awaited peaceful night in Crater Lake National Park in Oregon, avid astrophotographer Brad Goldpaint was pleasantly surprised to witness this jaw-dropping spectacle on June 1, 2013. "Near 11 p.m., I was staring upward towards a clear night sky when suddenly, without much warning, an unmistakable faint glow of the aurora borealis began erupting in front of me. I quickly packed up my gear, hiked down to my truck, and sped to a north facing location," Goldpaint told SPACE.com in an email. "With adrenaline pumping, I raced to the edge of the caldera, set up a time-lapse sequence, and watched northern lights dance until sunrise," Goldpaint said. "The moon rose around 2 a.m. and blanketed the surrounding landscape with a faint glow, adding depth and texture to the shot."